Events on a route, such as Anomaly and ILISurvey Readings, can be represented as single point events with measure information along the route. The Add Point Events widget allows you to create new point events using the Event Editor app. As shown in the following example, RouteA, RouteB, and RouteC are part of the same line. 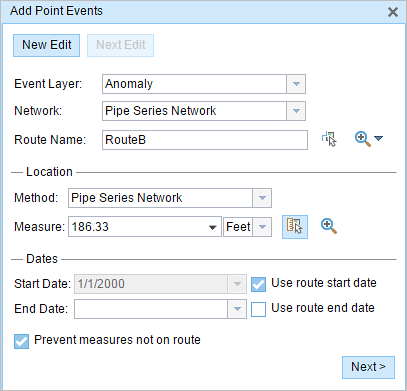 An event with ID Event1 is added to RouteB using the Add Point Events widget. If the event ID field in the event layer is not a String data type (minimum 32-character length), Event Editor (EE) will not provide an event ID and will not support editing of that event. It’s important to model internal events with an event ID. See the Event Editor (EE) deployment guide for additional information. In cases where events are modified on a route and you want to see the previous events on the route at that location, don't use the Add Point Events widget. Instead, edit events in the Event Selection table or the Attribute Set Selection table. If this method is used, you'll see what was previously on the routes at the specified measures. The measure is located on the basis of the measure values from the selected route. The measure is located at an offset distance from an intersection present at a selected route. The measure is located at an offset distance from a point event located at a selected route. A temporary engineering station is created on a route with a station value. The measure is located at an offset distance (using a station value) from the station. A starting or base station is identified from the stationing points on the map. The start or end of the event is located at an offset distance (using a station value) from the base station. The measure is located at an offset distance (using a station value) from an existing engineering station. The event is located using x,y coordinates. If the coordinate location does not fall on the route, the nearest location on the route is chosen. You can specify the LRS Network that will be used as a source LRM for inputting the location for the new point event. If the selected LRS Network is not the same as the one where the point event layer is registered, Event Editor (EE) performs an internal translation of measures to always store the measure value in the LRM of the LRS Network where the event is registered. As shown in the following example, the point event is registered with the target network, but the route belonging to the source network is used for locating it. Clicking the Save button in the Add Point Events widget stores the point event to the route that belongs to the target network. No one has a lock on the point event layer in any version of the feature service for the route on which the events will be located. You already have an event lock on the point event layer in the same version of the feature service in which you're currently working. The point event layer is already locked by a different person for the route on which the event will be located. The point event layer is already locked by you for the route on which the event will be located but in a different version. The route on which the event will be located is already locked by a different person. The route on which the event will be located is already locked by your but in a different version.